After a twelve year journey in space, the Rosetta spacecraft has less than 24 hours of life left before it crashes straight into the comet it has been orbiting. Today at 3 p.m., Rosetta team scientist Paul Weissman will be here taking your questions live. Rosetta was originally launched by the ESA back in 2004. It was only after a journey of ten years that it finally arrived at Comet Churyumov–Gerasimenko and attempted a daring touchdown by the spacecraft’s accompanying lander, Philae. Some unexpected bounces meant that Philae was almost lost in space—but it managed to hang on and send back data before powering down. 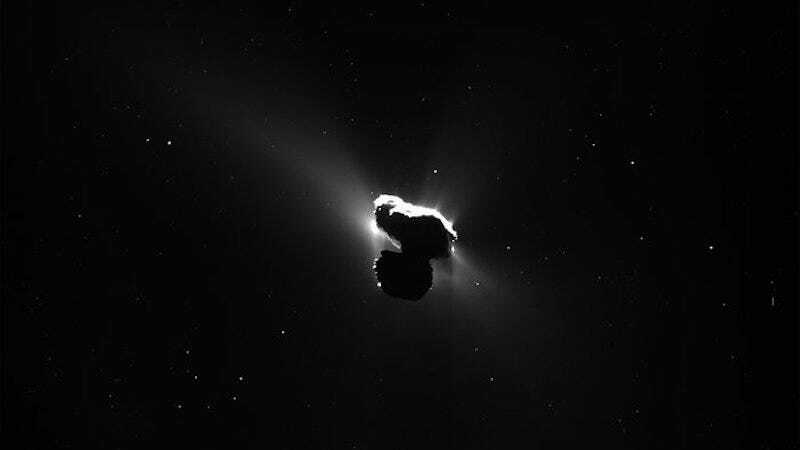 Now, as Rosetta prepares to join it on the surface of Comet 67P—this time, though, with a crash—ESA scientists are looking at the end of a more than decades-long mission that has revealed more about comets than perhaps any other mission. In addition to his work as an interdisciplinary scientist for ESA’s Rosetta team, Weissman is also a senior scientist at the Planetary Science Institute in Pasadena, California, where he focuses on the evolution of comets. He’ll be joining us here live at 3 p.m. EDT to answer your questions. So start dropping your questions—about comets, the final images we’ll see as Rosetta prepares to die, the bouncing Philae lander and anything else you want to know—right now. Update 3:20 p.m.: We’re having a little technical difficulty, but Paul is standing by and will be answering your questions shortly. Update 5:10 p.m.: And the Q&A has now wrapped up. Thanks again to Paul for joining us and to everyone who asked a question.